Does your client become hysterical at the sight of a spider? A fear of spiders, or arachnophobia, is very common and thought to be linked to an innate survival instinct. However, most house spiders are harmless and are usually far more frightened of us than we could imagine, which is why they often either freeze or scamper off in a different direction whenever they see us. Most people suffering from phobias realize that their fears are irrational but cannot help the emotional response. 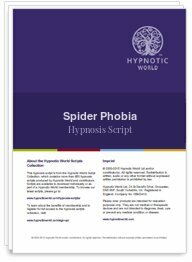 Hypnotherapy can be extremely effective in helping us to change our emotional state and this Spider Phobia hypnosis script combines creative imagery with future projection, providing the subconscious mind with an opportunity to change and rehearse these changes in response. When faced with an eight-legged friend in future scenarios, the mind can then recall the most recent positive encounter with spiders and react in a calm and confident manner.